The week is in the dying minutes of the fourth quarter, which means it’s time for the Sunday Substitute! It’s the article where I get some valuable minutes while the star is resting on the bench. I might not have the time to do this every week, but I like to think I’m still making a contribution to the team. Since it looks like NBA Live 18 will be released this year, I figured it would be a fantastic opportunity to look back at NBA Live 16 and determine what features are worth salvaging. For this article, I’m going to focus on the player upgrade system. I really love the player creation and upgrade system in NBA Live 16. It began for me with the most seamless face scan I have ever done in any video game. I’m not sure how everyone else went with it, but I know that my player in NBA Live 16 looks much more like me than any player I’ve created in the NBA 2K series. But my appreciation for player customisation in NBA Live 16 has gone far beyond that since I bought a full copy of the game. Not only is the player upgrade system an excellent feature in NBA Live 16, but I believe it is superior to that of NBA 2K16, and even NBA 2K17. I know it’s a big call – since the NBA 2K games have the advantage in most areas – but I think NBA Live 16 had some intuitive features when it comes to upgrading created players. So, here are the player upgrade features that I not only love in NBA Live 16, but I think should be considered for NBA Live 18. When it comes to upgrading attributes, the simplest way is often the best. 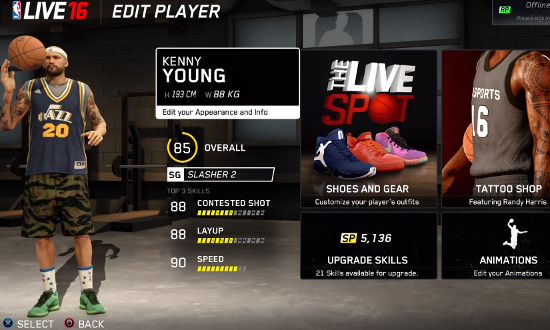 In NBA Live 16, the user can upgrade individual attributes. So, if you think your player needs improvement in stealing the ball, their quickness across the court, or shooting the ball from a specific range, you can improve these skills without improving the entire category they fall under. It makes a lot of sense, doesn’t it? 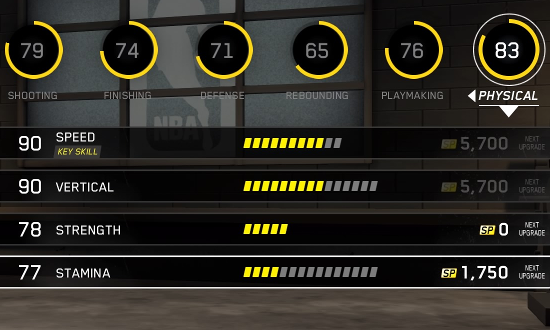 On top of being able to upgrade individual attributes, you can also see your ratings in the categories they fall under. This allows you to see numerically what your strengths and weaknesses are as a player. The most recent NBA 2K titles have represented these categorical ratings through graphs. While these make for interesting visual guides, it can often be hard to quantify just how good your player really is in specific areas. This could just be a personal preference, but I believe numerical ratings convey a player’s skill so much clearer. 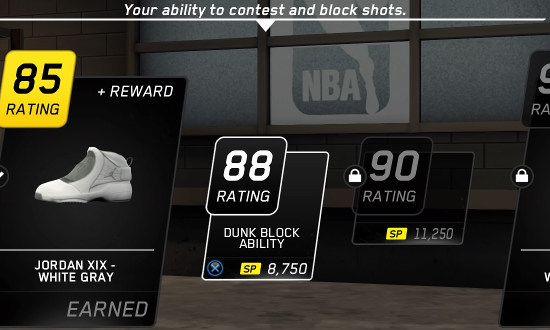 In conjunction with upgrading individual attributes, specific in-game abilities are unlocked at certain rating points. For example, the ability to block dunks can only be unlocked once a player reaches a block rating of 88. I admit that this is somewhat of a polarising feature. The idea that you can unlock certain abilities like blocking dunks and grabbing athletic rebounds may seem like gameplay could be canned. However, abilities being locked at certain ratings also encourages players to commit to certain skill sets. This means the online players no longer have every ability at their disposal by virtue of height or athleticism. If a player wants to make a 7’3” centre, they must make an initial choice whether to put attributes in defence or offence. If they choose to be defensive, then they have limited range and scoring abilities. If they choose to be offensive, they run the risk of being on every dunker’s poster. I couldn’t count the amount of times I’ve had my dunks blocked by someone I have beaten off the dribble, so I think nerfing the ability to block dunks by way of attributes is fantastic. But I’m not just going to pick on the 7-foot cheesers, again. The ability to unlock in-game abilities is also an excellent feature for nerfing overpowered skills for smaller players. One way NBA Live 16 does this is through dribbling ratings. Guards must upgrade their dribbling ratings before they can unlock specific dribble moves. So the lower their ratings, the more predictable their moves are, which in theory means they’re easier to defend. Only the best can break ankles, and that’s the way it should be. The implementation of player archetypes in NBA 2K17 was well-intentioned, but it ended up being far too limiting. If you chose to be a sharpshooter or a stretch big, shooting was basically all you ended up being great at. This was completely at odds with the player that Pres was hyped to be in MyCAREER. While NBA Live 16 doesn’t have an archetype system, the way it handles player types is excellent and gives the player the ability to change their mind. In NBA Live 16, player types are determined by ratings, instead of being predetermined by the player creation system. 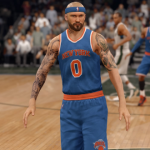 NBA 2K16 had a similar system – where it upgraded the player type the higher the ratings were increased – but NBA Live 16 made the player more conscious of it. When the change is about to be made, the game asks you whether you want to switch your player type. If you don’t, then you are able to go back and put the skill points into a more suitable attribute. Not only is this feature great for player flexibility, but it’s also realistic. Often, players in the NBA must adapt their skill sets when they are playing for specific teams. For example, Chris Bosh and Vince Carter both had to embrace more outside scoring type roles later in their careers. By giving NBA Live players the same option to switch up their player type, they can also adapt to what their squad needs as well. So, those are the three player upgrade features I love in NBA Live 16 that should be restored in NBA Live 18. Have you played NBA Live 16? What did you think of the features I mentioned? Please feel free to leave comments below. I definitely like NBA Live 16’s approach of being able to morph into other styles/archetypes, or become something of a hybrid. That’s what 2K should do with MyPLAYER Archetypes; have cheaper upgrades for Archetype specialities, but through training or more expensive upgrades, be able to become more of a well-rounded/hybrid type of player. The separate “currencies” also remain a fantastic approach that demonstrates goodwill through an avoidance of microtransactions, and no need to choose between skill upgrades or gear. That said, I find that I’m left with more RP than I need, so it’d be great if you could trade RP in for SP, presumably with a cents-on-the-dollar approach.